We are pleased to welcome you to the county in Denmark that has the most varied sportfishing to offer in the whole country. No exaggeration! Whereas most counties usually have one or two particular kinds of sportfishing to offer, the county of Aarhus has it all, be it river or lake, running water or stillwater, freshwater or saltwater. You name it - we've got it right here at our doorstep. We have excellent conditions for those of you interested in saltwater fishing for cod and other species in the very Bay of Aarhus. We also have the boats with experienced captains and crews to take you out where fish are biting. If you prefer Terra Firma instead of a rolling boat, we have hundreds and hundreds of kilometres of productive shoreline fishing to be enjoyed. Places where you can do battle with silvery seatrout, potbellied cod and - during the season - longbilled garfish. Not to mention the myriads of flatfish that lurk all over. - Maybe you are more into freshwater fishing? Then we highly recommend the Lake District of Jutland where you will find productive lakes, one after the other, in a confined area of great natural beauty. Here you will soon be into pike, perch and zander if you like the predatory species. Or an abundance of coarsefish in lakes that hold promise of new world records. If you prefer running waters and salmonid species, may we suggest that you take a closer look at the longest river system in Denmark - the River Guden? In the upper reaches of this river you may float your flies over brown trout and grayling. In the lower part salmon and heavy seatrout are the prizes waiting for you. - What more could a serious angler ask for? All in a confined area that can be covered in a few hours by car. And all within easy reach of Aarhus/Tirstrup Airport that has regular lowprice flights into and out of London/Stanstead. 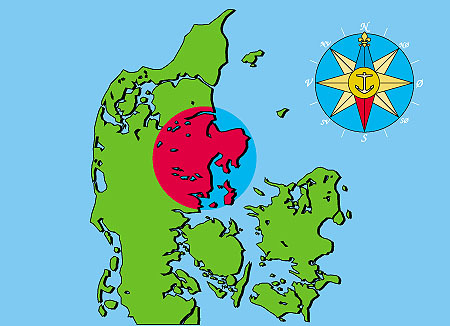 This website has more than 50 pages crammed with valuable information on the fishing to be had in East Jutland, what fish species to expect, what tackle to bring, where to stay and where to book. We look forward to seeing you here.